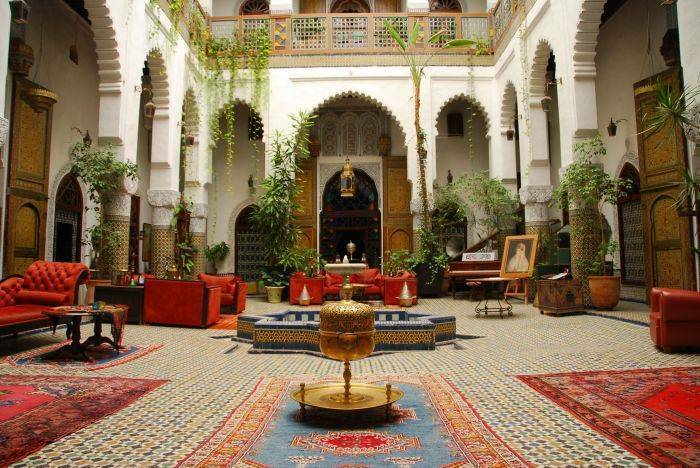 Located in the heart of the old medina's Andalusian district of Fez , this magnificient 18th Century palace belongs to a well-known Fassi family. 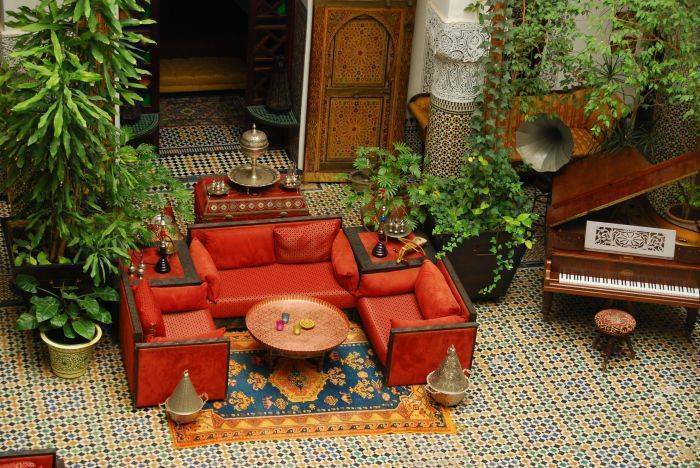 All rooms are situated around the central courtyard with its famous restaurant DAR TAJINE. In the furnishings and names conferred on the superb guest-rooms and suites the spirit of the former occupants seems still present in this noble house. Faithful to its culinary tradition, the palace houses a well-known restaurant with a table d'hôtes of great finesse serving true Fassi cooking, the most famous of Moroccan cuisines. On our terrace you can appreciate the Fes gastronomy while enjoying a unique view on the whole medina with its uncountable minarets. You can also relax there sipping a drink at any time of the day. You wish to relax and take care of your body? Let us organize an authentic hammam hour for you with massage and manicure. We can make a hair appointment on request. 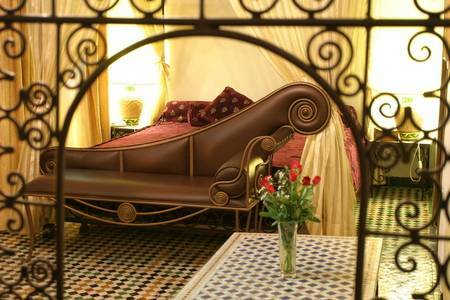 A beautiful first class residence, ideal for those looking for a real Moroccan. This house has been in Lebbar family . From the outside it appears just like its neighbours, but step through the heavy wooden doors and enter another world. The central courtyard has tiled floors, a tinkling fountain, palms and shrubs and exquisite architecture. 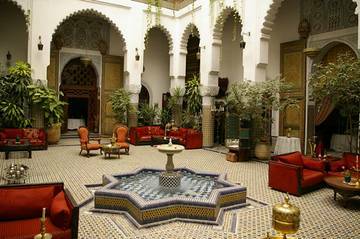 This is the focal point of the Riad with public rooms and some suites leading off the courtyard. Most guest rooms (there are only 14) are on 2 upper floors. On the first level there are most attractive double rooms and on the higher floor there are a selection of totally individual but very charming suites, larger rooms with a sitting area, 7 have bathrooms and 7 have shower rooms. Apart from the air of comfort and good living that permeates throughout, the service here is memorable. Breakfast is a feast and on warm days service is on the rooftop terrace with views over the old town towards the new town on the hill. Dinner is candlelit in a small intimate room off the courtyard or in the courtyard itself. We recommend the Dar El Ghalia for its great style, thoughtful good service, excellent cuisine and its difference. staff will park your car for you and walk you to the hotel. 02 Standard room double with a bathroom and 01twin room with shower on the 1st floor. All standard room has an area of approximately 20 sqm. It has an Air conditioning , a heating, a telephone, a Safe and a free acces to ADSL Internet (WiFi system). Five Luxury suite with bathroom (shower or bath) and a fireplace . Each suite has an area of 36 square metres. She has a safe, a mini bar, an acces to Internet ADSL (free 24/24), an air conditioning, a heating, a free satellite TV, a DVD-CD player, a telephone, sheets and towels, bathrobes for beauty care, household linen very Refined. A Royal Suite on the 1st floor with an area of about 92 square meters. This suite has three double rooms for 06 people maximum, a living room with a fireplace, two bathrooms, a free safe, a mini bar, an acces to Internet ADSL (free 24/24), an air conditioning, a heating, a satellite TV, a DVD-CD player, a telephone, sheets and towels, bathrobes for beauty care, It has a luxurious decoration and a charm to the East that will make travel in a true tale of a thousand and One Nights. 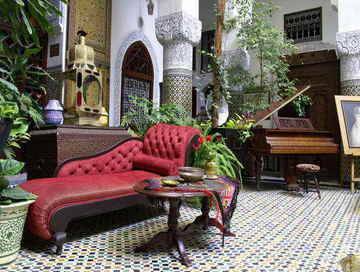 The riad is Located in the heart of the old medina of Fes , a few minutes walk from the hotel . It is a 5min far from the famous place's RCIF, at approximately of cinema AMAL and BMCE Bank. 2°/ Payment of the balance directly to Riad (75%). 1°/ For any case The deposit of 25% will not be refunded and will be considered as a deposit for future reservations (for the same clients) in a time of less than a year. 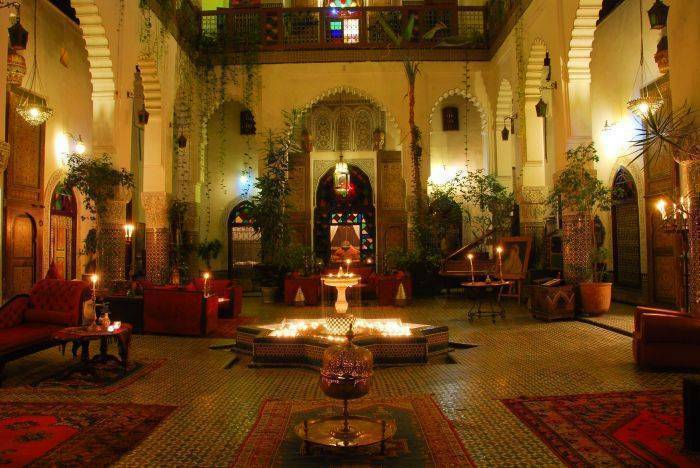 Riad El Ghalia is located behind a discreet facade, this 18th century palace is in the heart of the old medina of Fes a few minutes walk from the souks . The nearly gate of Hotel is Bab Jdid Gate . Accessible by car to the Rcif place. The station train is at 3km from the hotel(10min by Bus N°19). The New city is at 3km far from the hotel( connected by Bus N°19, 29 and 45).